There is a much older demographic of members typically representing well established officers and retired military. Attracting and retaining new members in the younger demographic is difficult while trying to still ensure that the older demographic is being supported with the correct content. Most military non-profits have many programs, divisions, initiatives, and other forms of internal competition fragmenting the presentation of information. So how are you going to address a very diverse set of members and potential members in a single web presence? Surprisingly the deployment of this digital strategy can be managed by technology and all that is required of the military non-profit is a sound strategy for each of the target demographics. What I’m talking about is a rich content delivery platform coupled with the capability of individual personalization of content based on a member’s account profile. Establishing a platform in which content can be delivered correctly to mobile phones, tablets, desktops, and laptops across the majority of main stream operating systems is a major step in ensuring retention of your members. You'll find that even the older demographic of 60+ years of age is using tablet and phone based devices now to browse the web. Interestingly enough most of this demographic has selected the iOS (Apple) platform for its simplistic nature while the younger generation (perhaps more active duty driven) is choosing a mixed bag of options anywhwere from iOS to Android to Windows Mobile 8. Attempting to ensure that your content is delivered in an easily consumable format to all these devices will take some extensive pre-planning but if done correctly will allow you to contribute content to the core of your web presence(s) and be automatically handled correctly by each of the devices that access your website. Once you are able to reach your members where they browse, you can start building customized experiences for potential new members and existing members. Let's talk existing members first since in a military non-profit the best method of recruitment is the existing body of supporters. Every day you have members logging in and out of your website to garner information from your organizations website. It's why they became members, whether to support specific lobbying initiatives, attend conferences focused around pressing military matters, or perhaps to view the latest online articles that have been recently published from your magazine. Whatever the reason each member has a distinct set of information they enjoy acquiring from your website and that data is to your advantage. By cataloging and tracking each member’s consumption of information you can dynamically change the way the website presents itself and offer information that may be of interest to that particular audience member profile. Additionally, you can see what calls to action are or are not working for a particular member profile and make changes to better target that audience. A member has registered for an upcoming conference on your website and after doing so is still presented with promotions to drive attendance for the conference in the major image banner on most pages of your website and also calls-to-action in the consistent rail of your website. 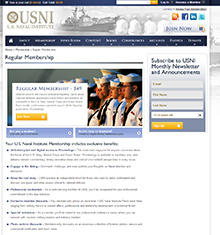 Three major areas of content are presented to your members upon logging in. Data shows that of these three major areas he/she has never clicked on any link or piece of information in one. You have different initiatives underway that require additional funding. All members are receiving the same call to actions and no one is engaging. In each of these scenarios we have a terrific opportunity to create a very engaging experience through dynamic rule sets that help us get our membership more engaged. In the case of an upcoming event that a member has already registered for why are you still wasting time showing them the same banner? They've already registered! Let's get that big banner and right rail doing something more productive like showing more content recently contributed by the editorial staff or perhaps there is a book by one of the speakers you'd like to promote to the member as suggested reading before the event. Now that they’re registered, build excitement for the conference, offer additional promotions to help support the event, and get them to bring along a friend! For item #2 this is the hardest reality for organizations to realize. Yes you want them to see that content, but the answer is really that they don't care. If the data is showing they aren't interested in advocacy let's get them better content focused around there clear passion for historical military battles and the photo archives. And finally, on item #3 nothing is more powerful than understanding that members interest and asking for their help directly in supporting programs relating to that interest. Great examples are wounded warrior programs, historical programs, and traditional awards/celebratory events. If you're looking to properly address your mixed audience as a non-profit oganization supporting the military this is a great place to start. The up front effort can be large depending on what point your starting from but its well worth the effort. Unleashed Technologies are experts in consulting on and building highly flexible and scalable platforms for military non-profits that accomplish the mission of providing an execpetional web experience on a rich content delivery platform such as Drupal. I’m happy to answer any questions you have about engaging your audience with your non-profit military website design and development.